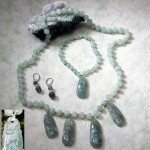 20” and 21” Gemstone Necklace and Earrings Sets. Variations with Peruvian Opal or Amethyst. These are sometimes called Fire Opals but those are rarer, all one color and more expensive. As you probably know by now, if you’ve read very many of my pages, I much prefer a stone that “paints a picture”. 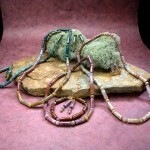 So, that means I enjoy making jewelry with interesting colors and patterns. Sometimes I sit looking at a bead, especially Rhyolite, almost entering into the swirling shapes, entranced with its natural abstraction. 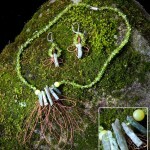 These two jewelry sets were made from two strands. They were a bit more than I like to pay per strand but they were so unusual I wanted to try them. 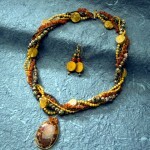 Usually I get only one strand of a gemstone bead thus making sure there will be only a one of that kind jewelry set. In this case, when I got them home I saw that some were more lavender and some more orangish. So I sorted the two strands by predominant color and found to my delight that there was enough of each for a necklace and earrings. To the group that showed more orange, I added the Peruvian Opal and Citrine. 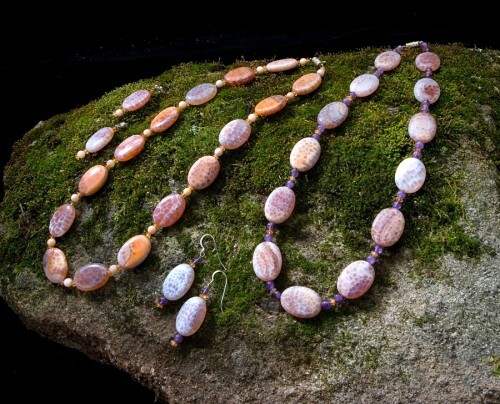 To the other were added Amethyst and Citrine, all from South America. I hope this unusual gemstone from Mexico fascinates you and gives you as much pleasure as it does me.